Quality Assurance | Cal Fasteners, Inc.
Cal-Fasteners, Inc. believes that an essential element of being a good supplier is to provide products of a consistent quality level. These products should meet or exceed your requirements. Cal-Fasteners, Inc. is committed to this principle. To meet our commitment to you, we have established an organized quality assurance program. This program consists of definite procedures as outlined in our quality control manual. We also have the equipment and personnel required to meet or exceed your quality requirements and specifications. Our organized quality assurance program guarantees that our products meet or exceed the requirements of ISO-9001. 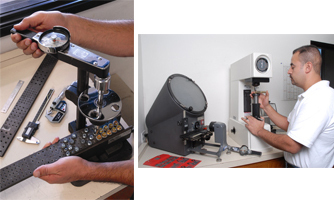 Cal Fasteners carries a full line of fasteners in both standard and metric sizes. We hope our commitment to your requirements will entitle us to be a substantial source to you on a continuing basis.